Our early new potatoes from the tunnel were great. We’ve had a lot of potato beetle pressure this year on our outdoor planting, so we expect our yields there will be lower. Also lost about 10% of the outdoor potatoes to the early heavy rains and flooding which caused the seed potatoes to rot in the wet ground! After we dug the potatoes we planted our ginger and turmeric crop. They had been waiting patiently in gallon-size pots for the space to become available. The turmeric was a bit harder to pre-sprout than the ginger, but looks like we’ll have plenty of ginger this fall! Snaps in the little tunnel. Just using up some old seed, interplanted with the eggplant, and what a spectacular display! 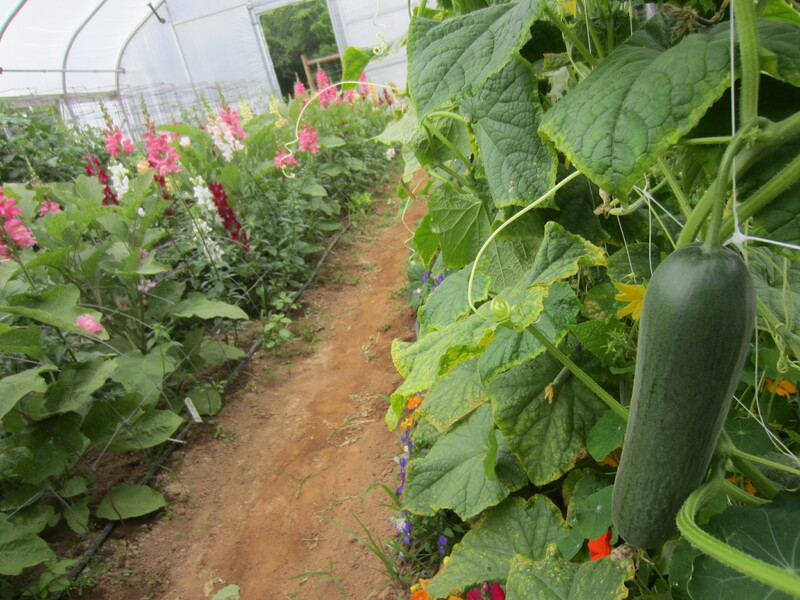 Sometimes a vegetable farmer has to grow something just for looks. Though the vegetables are often beautiful as well. 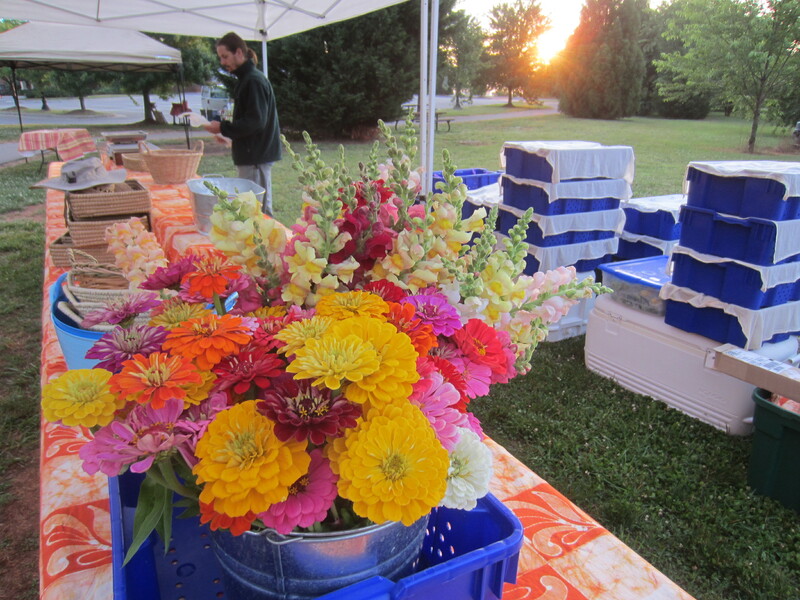 Setting up for market, early Saturday am. Almost ready to go. We are so grateful to be a part of such a vibrant market that continues to grow since its first year in 2011. 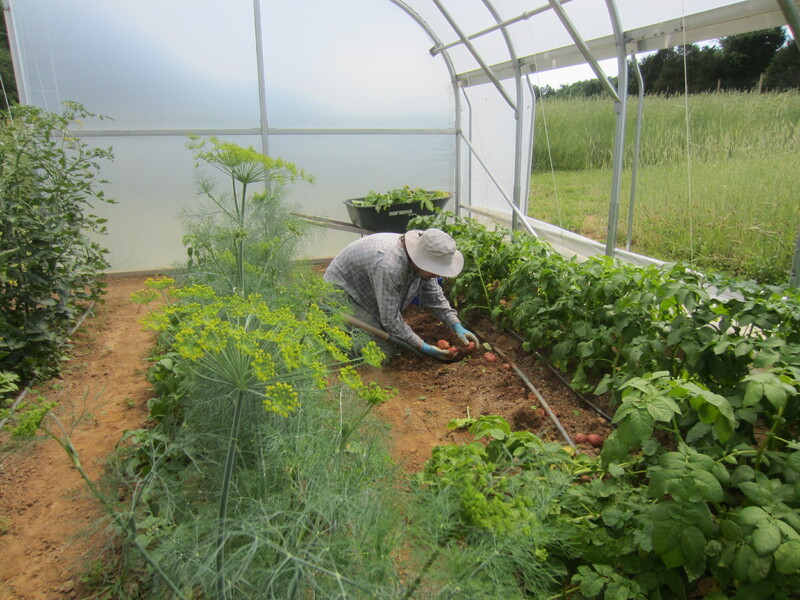 Many thanks to our wonderful customers and supporters who keep our farm, and the vendors from other local farms, producing nourishing food for the community. This work is our calling, and we hope you are well fed. 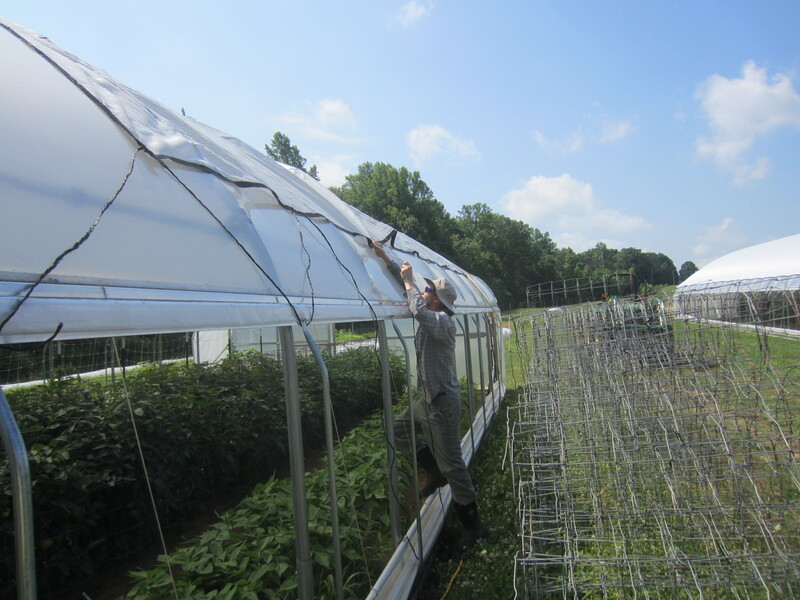 This year we are trying something new and putting shade cloth on all the structures, not just the potting house. 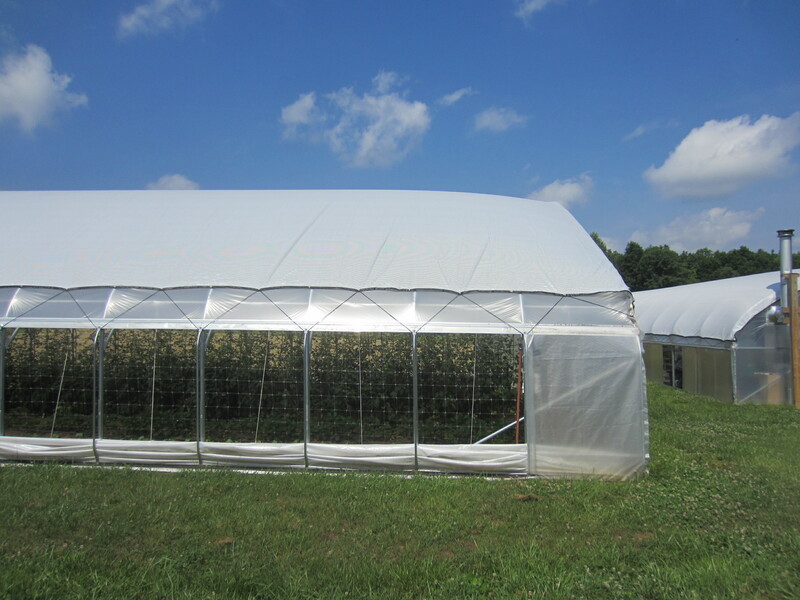 We bit the bullet this year and bought a huge shade cloth for the big tunnel. 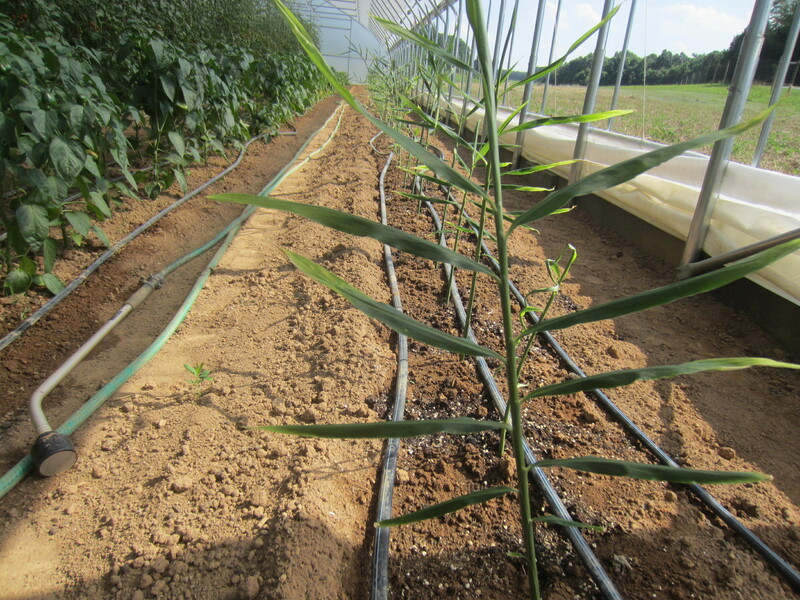 Hopefully it will prevent sunscald on the tomatoes and peppers, which has been a problem for us in past years. It also makes the many hours a week I spend inside the tunnels a bit more tolerable, even during the blazing hot days of summer. 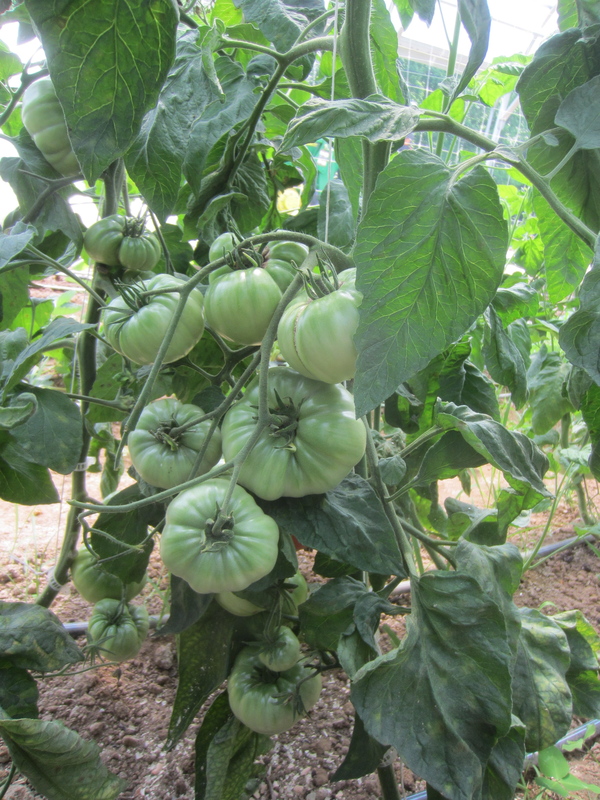 Some of the first tomatoes. With a touch of sunscald, we should have put that shadecloth on a few weeks earlier! Next year we will. Always learning something. 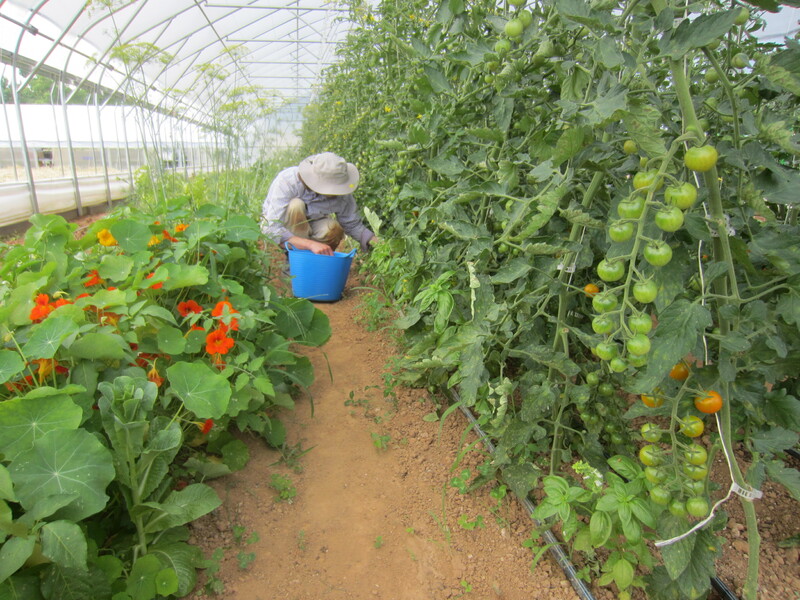 Harvesting the first cherry tomatoes. 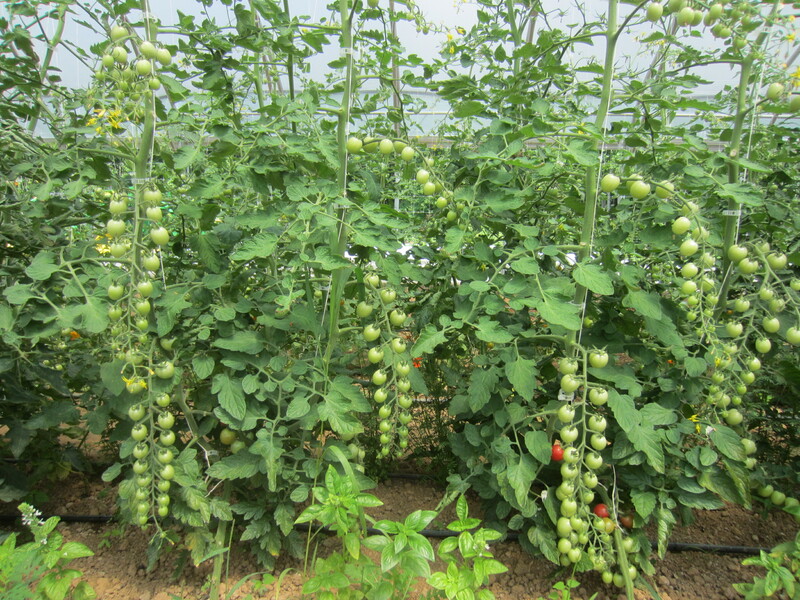 Since we’ve never pruned or trained our tomatoes before, I’ve never before seen such magnificent cherry tomato clusters. What a sight! It’s all so orderly. But the order only comes with many hours of extra work each week! So many bees buzzing around. They love the dill and cilantro flowers. Our first planting of cukes finally fruiting. 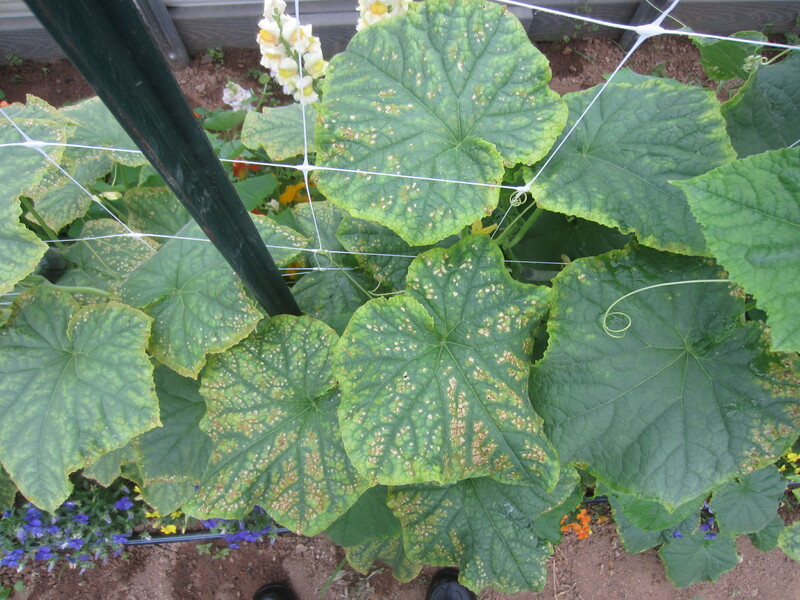 I love having cukes but they are a touchy crop when you’re growing without any sprays. 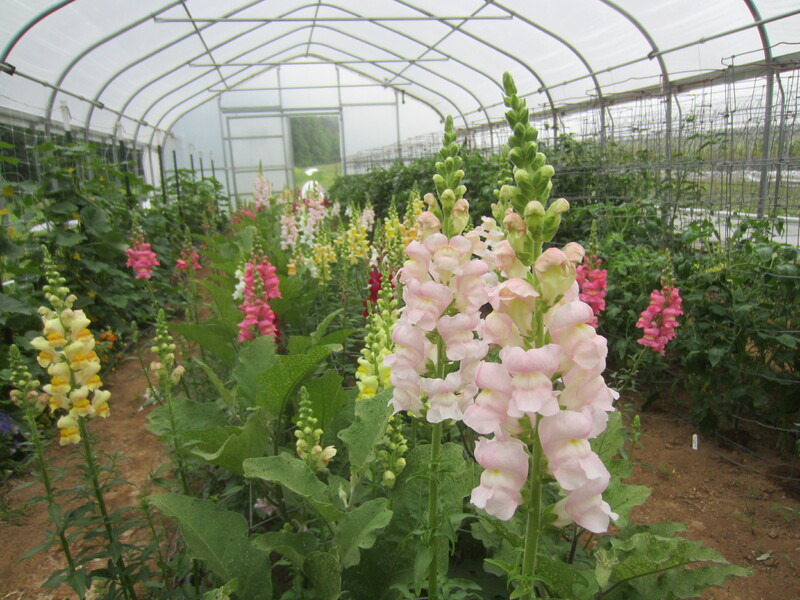 This planting won’t last long due to the cucumber beetles spreading viruses and disease. Good thing we have another planting coming right along behind it. But what lovely, blemish free, and tasty fruits… while they last! 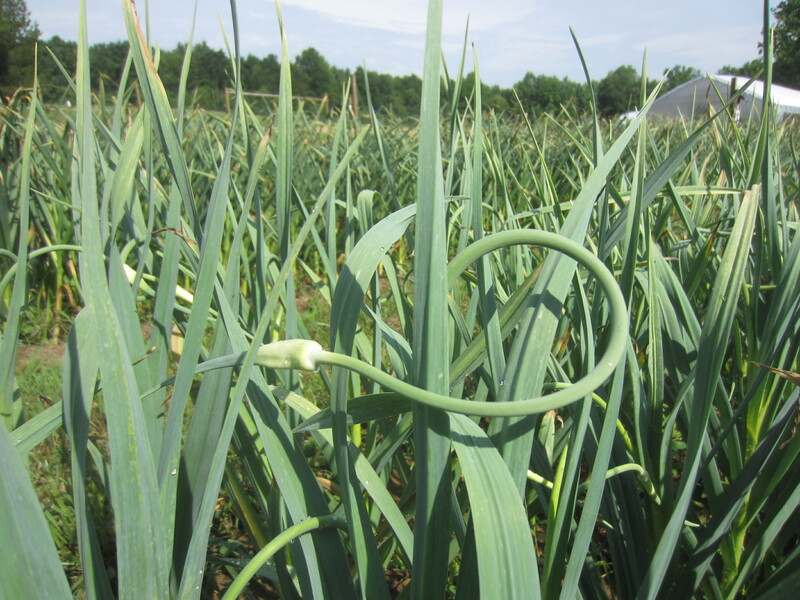 Garlic scapes on the hardnecks! 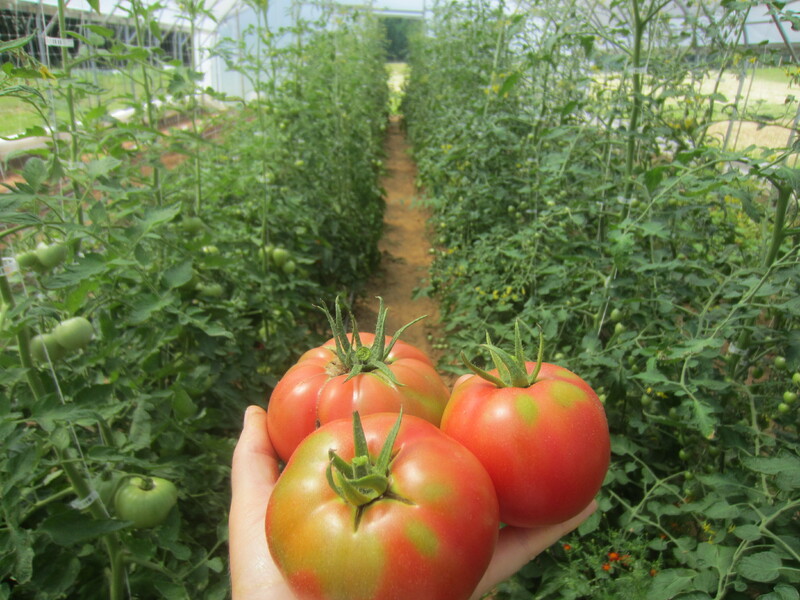 And we’ve just harvested our one softneck variety, Silver Rose! The jury is still out on whether or not we’ll grow softneck garlic again. 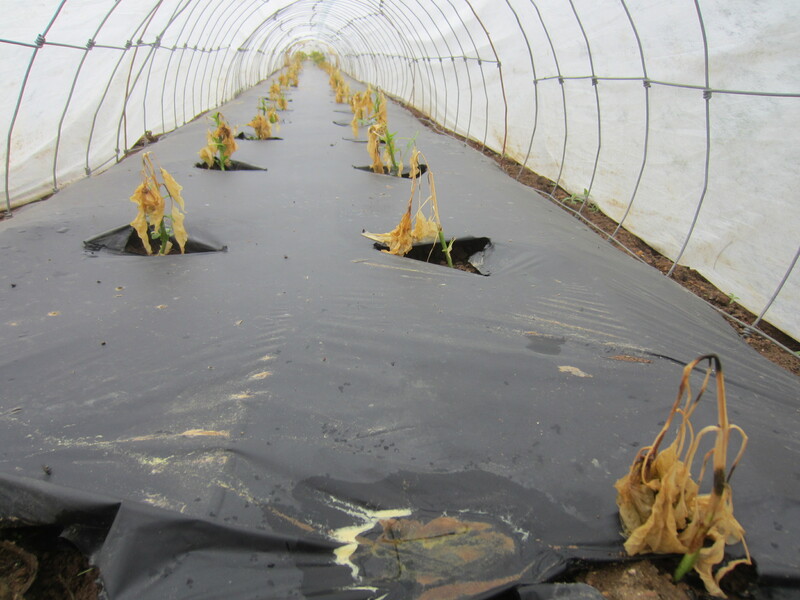 We had a large amount of rot in the planting, with only about 60% harvestable. In other allium news, our onions are bulbing. 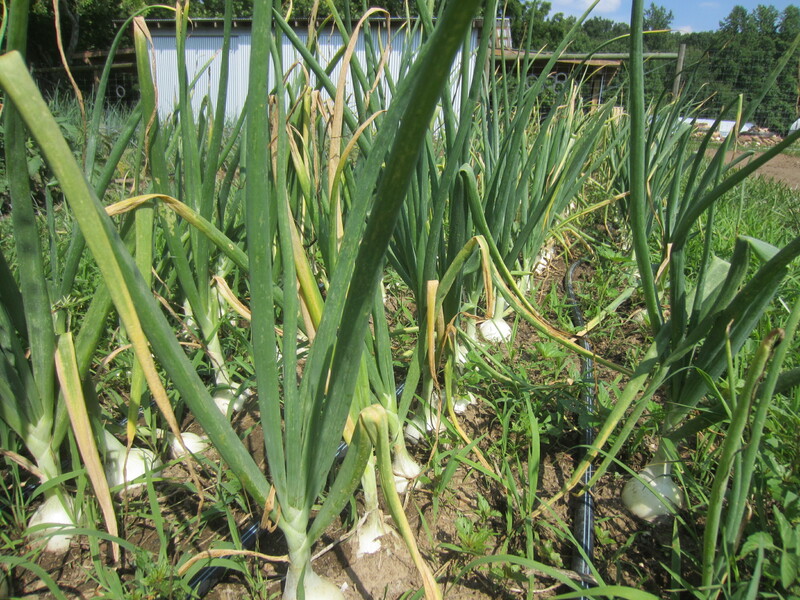 I vowed I would not let the onions get weedy this year, but unfortunately they did not respect my wishes. This was one of the ‘good’ rows! 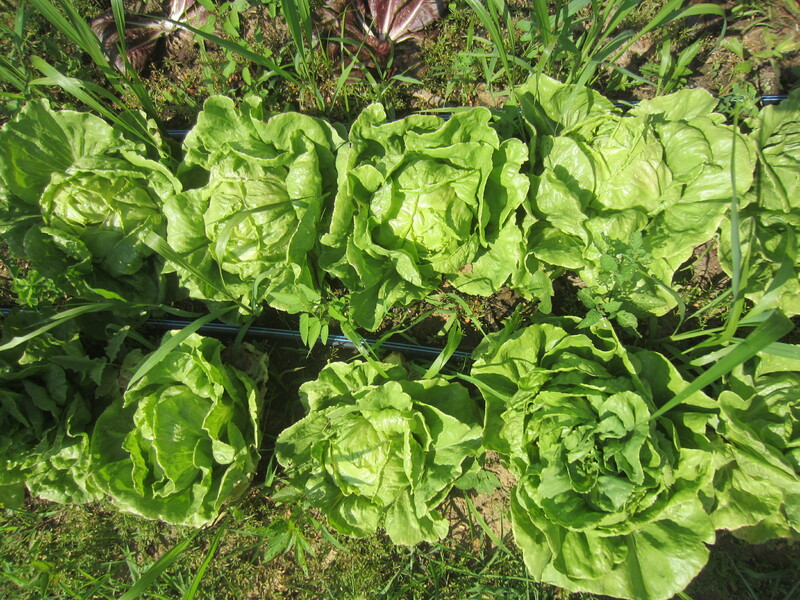 These lettuce heads won’t last long in this heat wave. 97 degrees tomorrow, ouch! 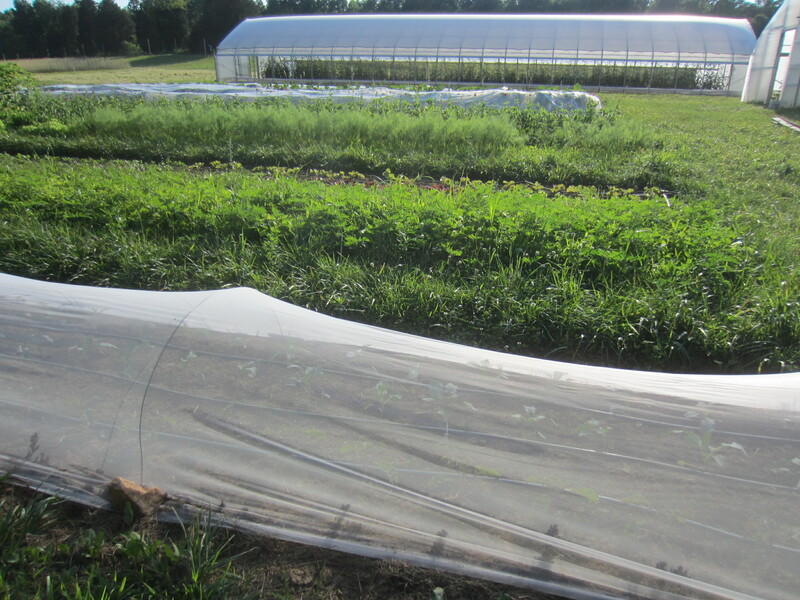 We’re trying out Proteknet insect netting this year as an alternative to row cover during the hot months. So far so good! 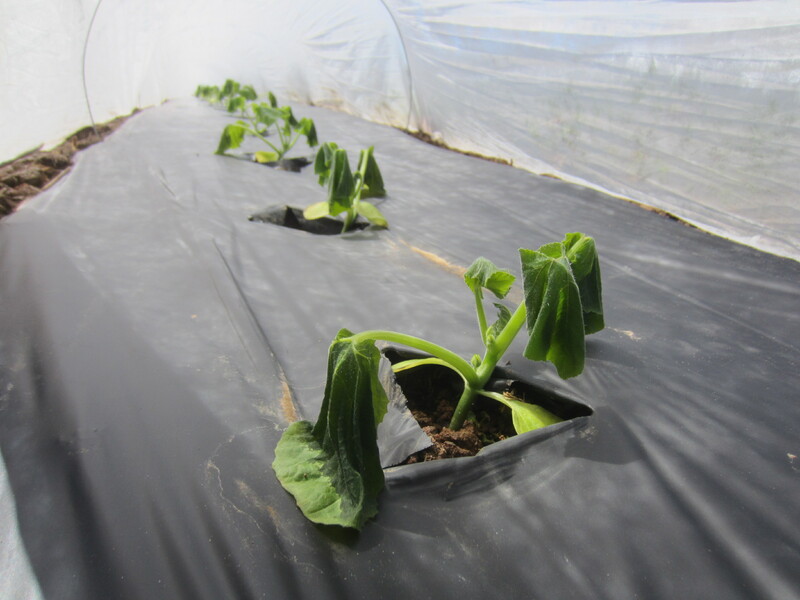 Our first planting of squash, after the three 25 degree nights in mid-April. We were amazed when they came back and we have now been harvesting off them for weeks! What a miracle. Also the hot peppers I was worried about, after that same freeze. And now look at them, all bushy and full of fruit. Nature is truly amazing sometimes. The land provides. If we let it! 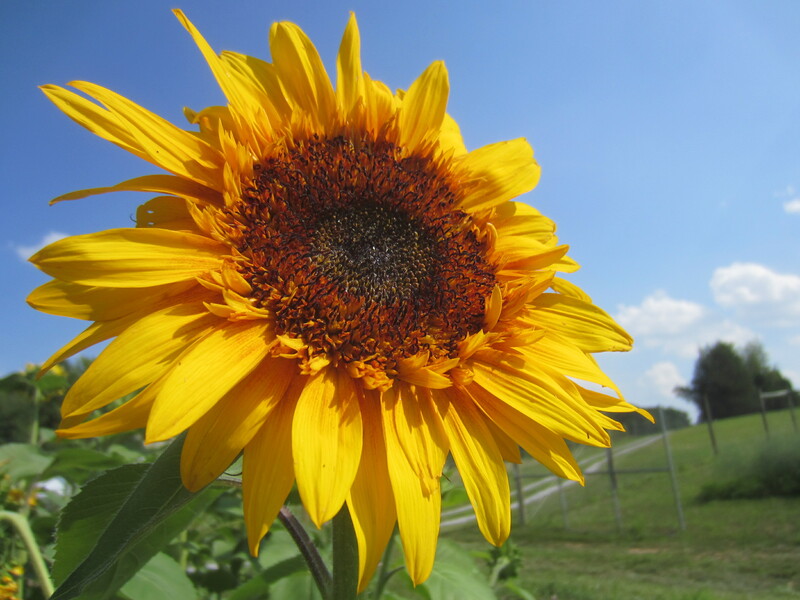 We’ve had a lot of volunteer sunflowers this year that I’ve let grow up. And they are beautiful. Besides doing the weekly market, we are now getting ready to plant fall leeks and the second (and what we now see is unnecessary!) 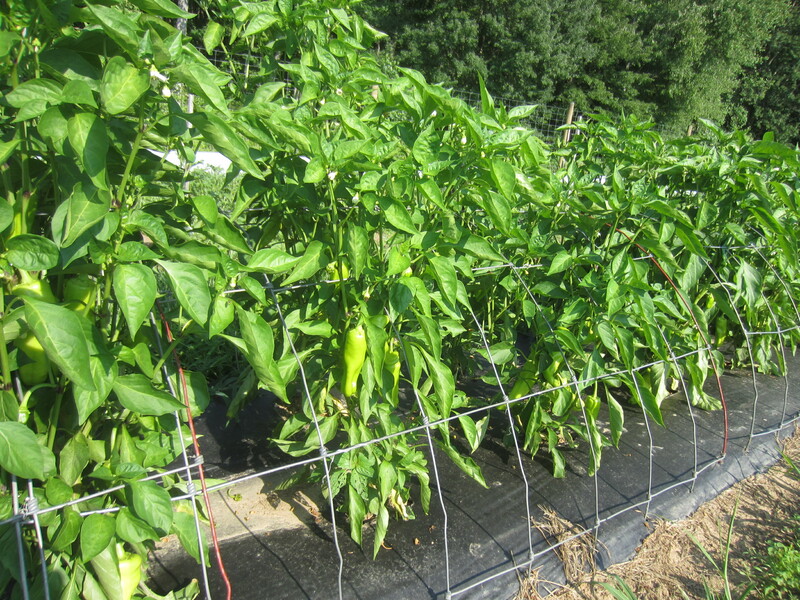 crop of hot peppers, potting up our late tomatoes, and starting to think about seeding fall crops. The elderberry is blooming. 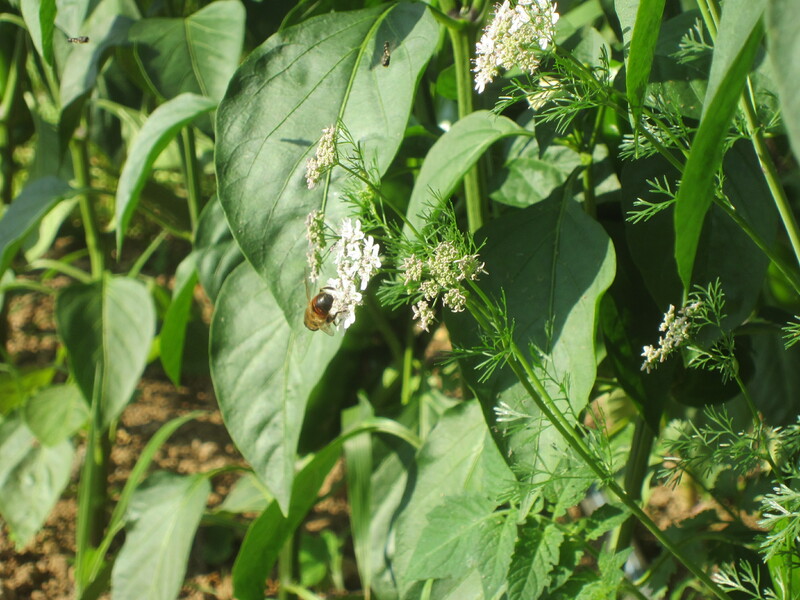 I’ve seen a blister beetle or two here and there, along with a few Japanese beetles. And we’ll be celebrating the summer solstice in just a few days! Ah, summer. Your pictures and commentary is very interesting. I feel like I’ve visited your farm! Such hard work and such wonderful results. Sorry…..the pictures and commentary ARE very interesting! Hi Meredith… thanks for taking the time to provide all the pics & info… love it all! Your energy and dedication are beyond impressive! Have you two tried selling to Fresh Market? 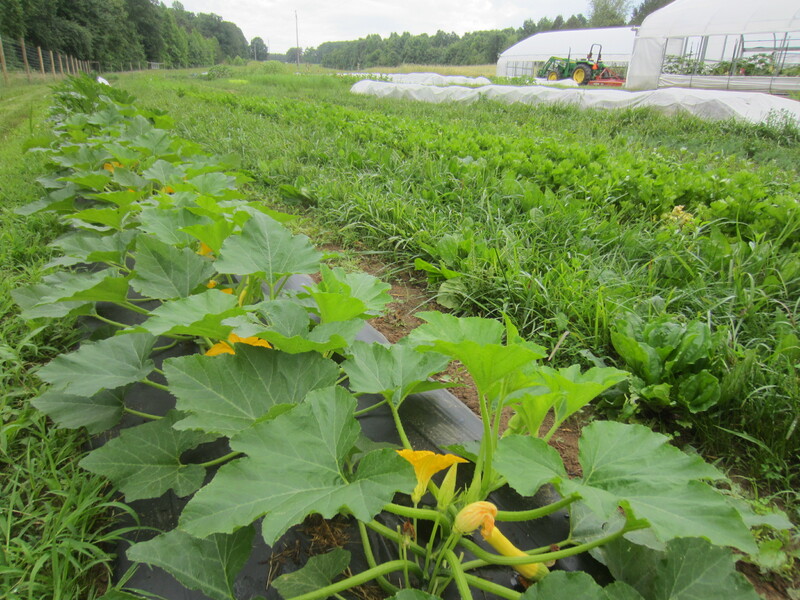 Marshall and I were talking to their produce manager last Saturday, and he said they are always looking for more organics… that they are increasingly hard to find, and the prices fluctuate dramatically, to the upside. He mentioned that one item went from $11/lb to $18 – in 1 week! 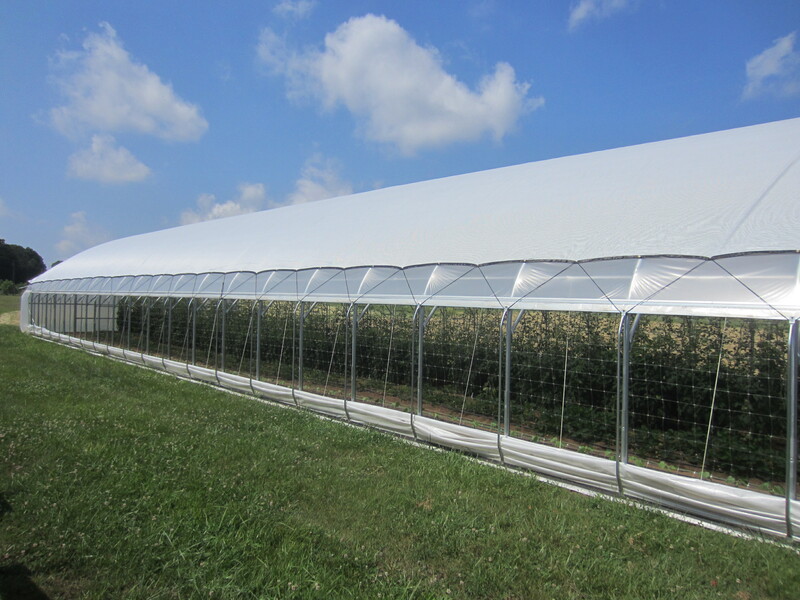 For the scale of operation we are, I think it would be hard to provide a big store like Fresh Market without reducing the number of crops we grow and specializing in just a few crops. 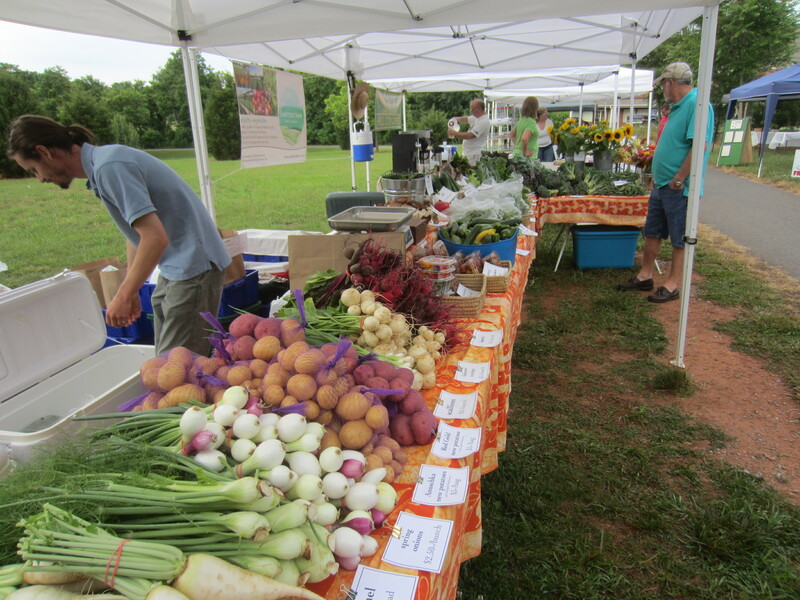 For now we are happy to grow small amounts of a diversity of crops and the farmers’ market is all we can handle! Hope you’re having a good week… see you soon! I found purslane in the backyard!! The stems are about two inches tall, growing in a mound of old grass clippings. Can I eat them, even though they’re wild?